Ronald Jose Acuna Blanco Jr.
Ronald Jose Acuna Blanco Jr. is one of the popular professional baseball outfielder. He is simply known as Ronald Acuna who plays for Atlanta Braves of Major League Baseball. He is well known Venezuelan celebrity. He is famous for contribution to professional life. He is best at outfielder position. Currently, he is playing in Atlanta Braves. He is a very talented baseball player. Passionate and enthusiastic player, Ronald Acuna was born on 18th December 1997. His full name is Ronald Jose Acuna Blanco Jr. He was born and raised in La Guaira, the city of Venezuela. He is the son of Ronald Acuna Sr. and Leonelis Blanco, his father, and mother. His nationality is Venezuelan. His astrological sign is Sagittarius. At the small age, he began his career with baseball. Ronald has got a great personality. Talking about his body, his height is 1.83 m. His weight is of 82 Kg. He has a balanced body with good health. He has an attractive body figure. His smiling face and charming personality have helped him to gain the attention of all the viewers. He made his MLB debut in the year 2018. 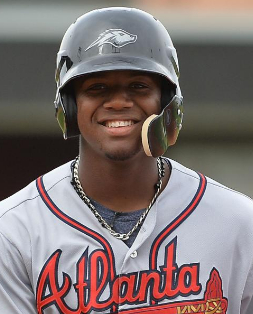 In the year 2014 of July Acuna signed with the Atlanta Braves for $100,000 as an international free agent and made his professional debut in the year 2015. In the year 2016, he hit .312/.392/.429 with four home runs and 19 RBIs in only 42 games combined between the Gulf Coast Braves and Rome Braves. In the year 2017, he made his appearances in Grapefruit League games. He was also named to the All-Star Futures Game roster in July. He was also ranked as No. 1 MLB into the season 2018. He was reassigned to minor league camp on March 19, 2018. Later on 25th April 2018, he was promoted and became the youngest player to play in major leagues. He made his MLB debut on 25th April 2018 against Cincinnati Reds. He was optioned to Triple-A Gwinett for a rehab assignment on 21st June 2018. Ronald has not revealed about his relationship to the media. He may be single and maybe he has a girlfriend. He is focusing on his career than in a relationship. This excellent player makes good money from his work. His net worth and salary are kept in privacy but there is no doubt in the mind of his supporters and followers he is satisfied with his earning. He might have earned a considerable amount of net worth and property about which he has not openly spoken about in public. His exact net worth figure is still yet to get unfolded.